Push Your Luck Podcast: Essen '13 - On the Radar - Suburbia Inc. If you have played Suburbia before, you would know that it is ripe for expansions. So much can be added to the base game to make it play differently and feel fresh. 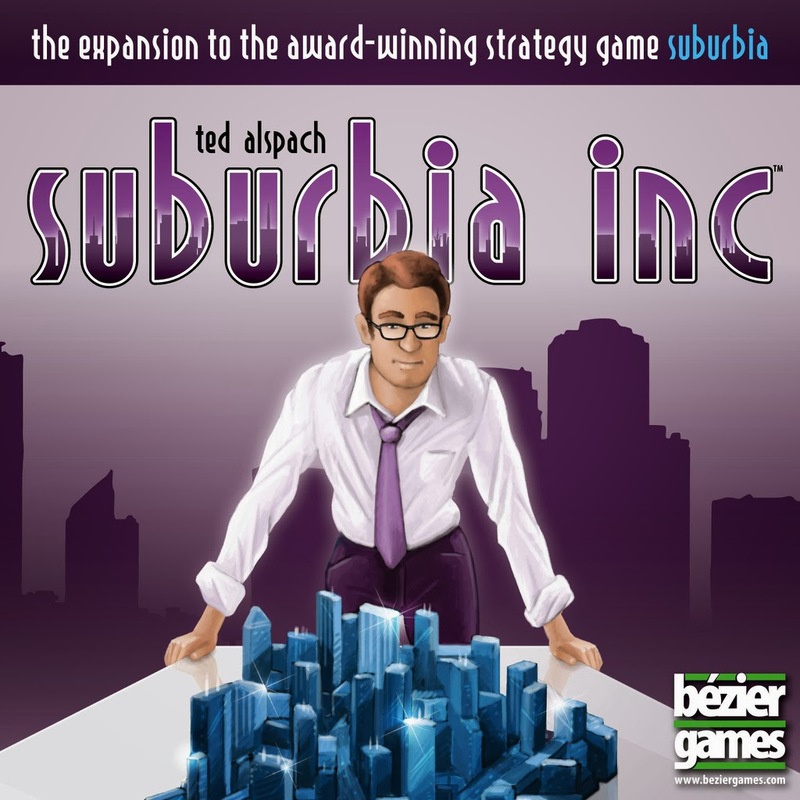 With Suburbia Inc. we get more of the same and a little of something different to shake things up a bit. With the expansion comes new city tiles ( naturally ), new goal tiles ( naturally ), and new elements that are the border tiles and bonus/challenge tiles. The border tiles are really long tiles that players may purchase instead of purchasing the regular city tiles. Border tiles provide certain benefits but at a cost of either money or tighter restrictions when building up your city. It’s also called border tiles because once the tile is built, no other tiles may be built beyond it. It basically shapes the way your city may be built from then forth. The border tiles look really interesting and I like how you may even built it diagonally across your city. Now everyone’s city is going to look strangely unique. The bonus/challenge tiles are also a very nice injection into the game. Bonus tiles stipulate a criteria that all players may meet. Each player that does so will receive an increase in income as stated on the tile. For bonus tiles, the criteria must be met by the end of the ‘A’ stack. The challenge tiles are the same as the bonus tiles, but reward players with increased reputation instead of income. And the challenge tile criteria has to be met by the end of the ‘B’ stack. It’s a really small addition to the game but it changes the game quite a bit as each player will be jostling for it under a tighter window as compared to the end game bonuses. And with so many things to fight for, it opens up the game and makes it much more varied and unpredictable. Suburbia Inc. is a no-brainer purchase for me. I do love expanding my games but on the condition that it does not make the game more complex and needlessly fiddly. Suburbia Inc. seems to fit the mold really well as a light level expansion that anyone can get into on the onset. My only fears for the expansion is how much more monitoring and bookkeeping it will add and whether there will be small nitty gritty rules that may confuse anyone who is not paying attention to details. But still, I’m greatly looking forward to this one. Now, just need to table it slightly more often.